Fairfield offers various types of screw conveyors, which are efficient in movement of a wide variety of materials in both horizontal and inclined applications. These screw conveyors are made from high quality steel and has various design also. Fairfield’s Screw conveyors capable of moving a vast variety of materials, the material is moved by a rotating screw that pushes or pulls the material along the bottom and sides of the conveyor housing, shearing the material in the radial clearance between the screw and conveyor housing and causing the material to tumble upon itself as the rotating screw’s face tends to lift the material. Fairfield also provides a Live bottom bins having capacity ranges from 200 to 1600 ft3/hr. Fairfield provides heat tracing which keeps the temperature of 40° F at an outside ambient temperature of 0° F. Hooper walls are galvanized with UHMW liners. The Fairfield belt conveyors are used to transport light to medium weight of loads such as screened material from bar screen. Belt conveyors can be horizontal or inclined (maximum of 28 degrees), designed to convey materials from the loading points to a discharge area. The friction of the belt can fix the items into the right place on the conveyor without some unnecessary bumps. Friction also avoids smooth accumulation; merging and sorting on the belt. This is available in open or fully enclosed type of construction. Fairfield is an industry leader in supplying belt feeders for a wide variety of industries, and applications. Fairfield Belt Feeders are innately smooth running, and when combined with a variable speed drive, they provide exceptional control over material flow rate. Belt feeders are the industry preference for removing bulk materials from hoppers, bins, and other storage vessels. In those applications, they are used to both control and measure the rate of material flow. Fairfield Belt Feeders are able to regulate material flow rate based upon either volume or tonnage. Volumetric feeding is achieved by designing a Belt Feeder in tandem with a material flow gate. The volume of material fed is dictated by the speed of the belt and the strike off height of the gate. To regulate material flow by tonnage, a belt scale is used to provide feedback to the feeder drive, thus controlling the tonnage. In addition to controlling material flow out of storage vessels, Belt Feeders are designed to control flow into screens or crushers. Belt feeders consist of short, reinforced belts operating over flat roll idlers. Sealed skirt assemblies contain the material centrally on the belt. Drives are typically on the head end of the feeder. Screw type take-ups are installed on tail shaft to maintain proper tension on the belt. Belt feeders are often selected in lieu of other types of feeders such as, vibrating, apron, flight, and reciprocating. Protecto conveyors are the obvious choice when conveying material that needs to be protected from the environment or when the environment needs to be protected from the material being conveyed. 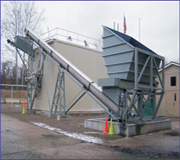 Fairfield is widely known as a supplier of sophisticated, customized conveying solutions. Our design capability and experience is exceptional. Fairfield’s veteran engineering team focuses our time-proven experience toward development of fully integrated systems which achieve the client needs and objectives. Our laser-like focus upon quality runs throughout our organization from Application Engineering to Production to Equipment Start-Up and Testing. Fairfield achieves success for our clients and for our selves, by partnering with them. We collaborate with our clients to define a project’s objectives and parameters. We then work closely with them to develop a cost-effective, high quality solution. This collaborative approach is the same for every application, whether the project requires a complex, integrated material handling system or a single piece of equipment.